Update 07-Feb-05: This just in - Japan is experimenting with musical road surfaces. You know those grooves that are cut into roads when you are approaching a toll station, or are heading off the side of the road? The Hokkaido Industrial Research Institute has created grooved sections of road that boom a melody up through your car. The grooves are a few millimetres deep and 6-12 mm wide; the closer they're grouped together the higher the pitch of the note produced. They're planning to use different melodies for different areas, picking songs that have some association to the locale. "It has a wide-open, breathless, ethereal howl quality I find just wonderful." Thanks to dottocomo via near near future. Wouldn't it be great to drive to your musical house along a musical road? Communities in northern Michigan, take note. Wege House is a unique house built along a Lake Michigan beach. The core of the house consists of massive beams forty feet in length. They are the basis for the core musical instruments of the house - two long stringed instruments. When played, the listener and the player are both inside the resonant chamber of the instrument. The instruments are tuned primarily through length; to create the tone of middle C on the piano, a forty foot long string is needed. 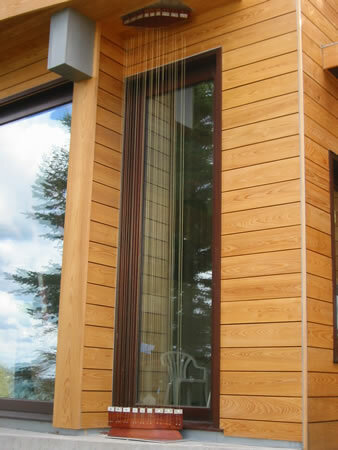 As you enter the house, there is a pattern of vertical strings close at hand. Another instrument is found in the stairwell; a player at the bottom plays low notes while a player on the third floor plays higher notes. First a player puts on a cotton glove that has rosin powder on the fingers. The glove helps to hold the rosin and keep natural oils off the strings. Two fingers lightly pinch the string and run along. This action creates a compression wave within the material of the string. The fingers push the vibration along in a similar manner that one might create tone by running their finger around the edge of a glass. The action produces tones akin to cello or viola, however they are more resonant with upper harmonics. 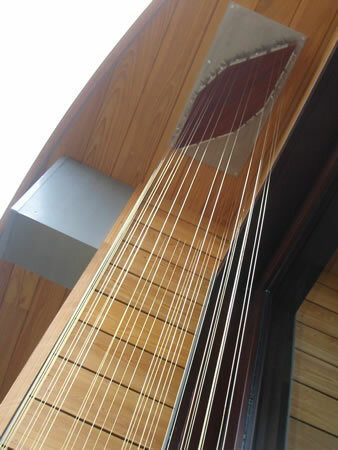 The exterior of the house also has two fifteen-foot tall outdoor harps built in that are positioned to be played by the wind. Read more about the Symphonic House (and listen to music or watch performance videos); thanks also to near near future.